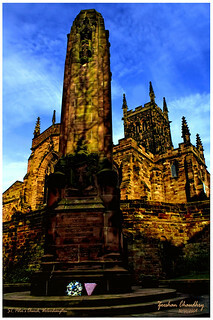 St. Peter's Collegiate Church is located on the highest and the oldest developed site in central Wolverhampton. It is Wolverhampton's Parish Church being the leading church of the Parish of Central Wolverhampton. The Grade I listed building, much of which dates from the 15th century, is of significant architectural and historical interest; although it is not a cathedral, it has a strong choral foundation in the English Cathedral tradition. Whilst there is a tradition that King Wulfhere of Mercia was involved in its beginnings, Charter evidence reveals that an earlier church was refounded as a Minster in AD994 by Lady Wulfrun (the Latin form is Wulfruna), who was believed to have been the grand-daughter of King Æthelred I and Queen Æthelflæd (daughter of King Alfred the Great). 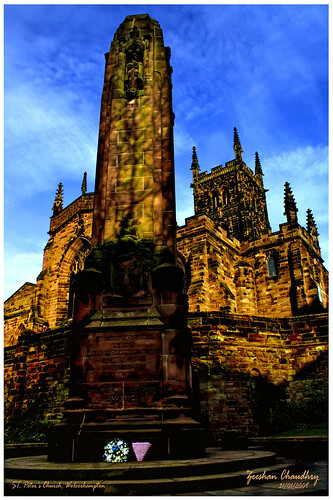 St Peter's Church is built of red sandstone on an elevated site in the centre of the City of Wolverhampton. The oldest part of the building above ground is the crossing under the tower, which probably dates from the beginnings of the Abbey in 1200, followed by the Chapel of Our Lady and St George (Lady Chapel). Much of the Church was rebuilt and extended in the fourteenth century, in the Decorated Style. However, the Church was to be substantially altered in the middle of the fifteenth century at the expense of the town's Wool Merchants, with the addition of a clerestory to the nave, and reduction in height of the north and south aisles. The upper part of the tower was rebuilt around 1475 to a height of 120 feet, and the Chapel of St Catherine and St Nicholas (Memorial Chapel) was completed at the end of the fifteenth century. The chancel was reconstructed in the 1860s to replace the one which had been rebuilt following considerable damage during the Civil War, and this was followed by extensive restoration of the Church in the 1850s under architect Ewan Christian. Unique features include the carved stone pulpit with a figure of a lion at the foot of the steps to protect the Minister delivering the sermon. The font dates from 1480 with several stone carved figures and the west gallery dates from 1610, paid for by the Merchant Taylors' Company for use by the boys of the Wolverhampton Grammar School. Near the south porch is a 14 foot high stone column, carved in the ninth century with birds, animals and acanthus. It may have been a column pillaged from Roman Viroconium and brought to Heantune, either as part of a preaching cross or memorial. The carvings have deteriorated, but a cast made in 1877 can be seen in the Victoria and Albert Museum in London.